Lauren’s positive attitude and passion for executing events brings great energy to our team! She is currently attending Rock Valley College earning her Associate’s of Arts degree and will be attending University of Wisconsin-Whitewater this fall, working to earn her Bachelor’s Degree in Business Administration. She enjoys watching each piece of an event come together, from linens, flowers and other décor, and being part of a bride’s special day brings her joy. 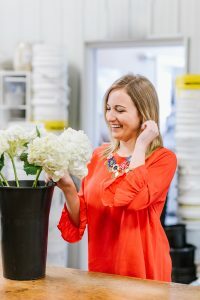 She is responsible for receiving and processing all of the fresh floral product received each week, and enjoys watching the design team create beautiful designs for each and every bride. In her free time, she enjoys volunteering for the United Way I Read program and dreams of becoming the CEO of her own business someday.